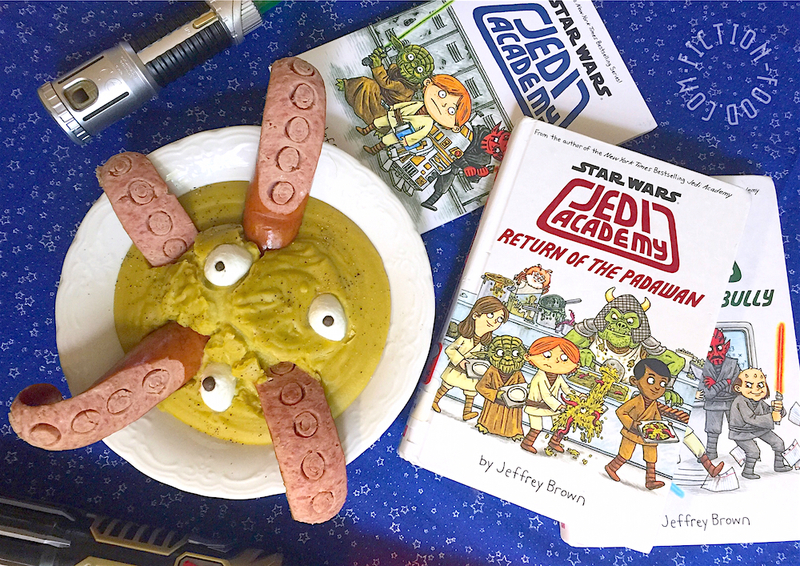 "Students will enjoy trying new and unusual meals from all over the galaxy in the Jedi Temple Cafeteria." The stories are a hodgepodge of comic pages and personal journal-style documents that are jammed with humor and heart, full of characters large and small from the Star Wars franchise, plus a cast of new faces for the books. The story follows young Roan chosen to attend the prestigious Jedi Academy to train in the ways of the force. 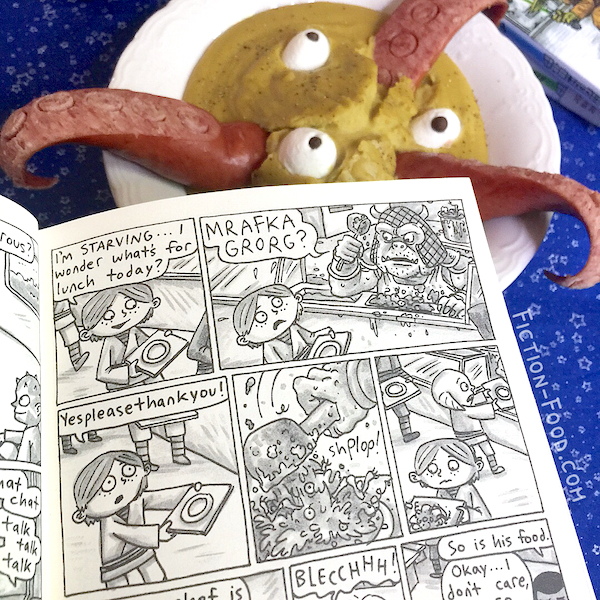 There he meets friends and bullies, challenges and triumphs, and lots of gross strange unique food. 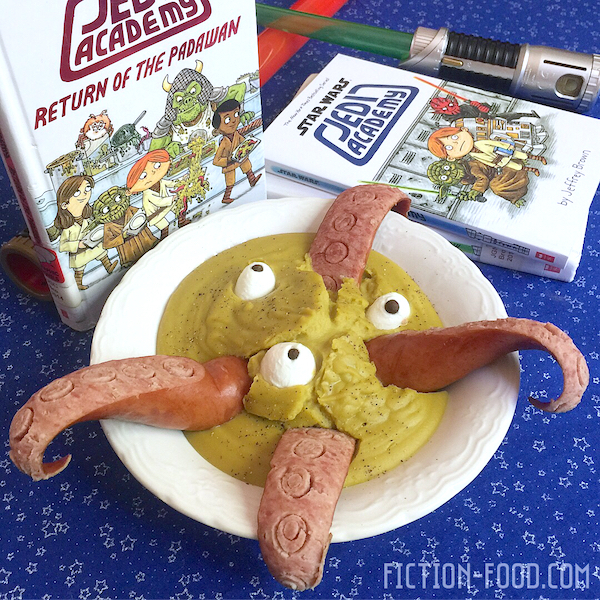 Gammy the Gamorrean chef and his eyeball and tentacle delicacies are not introduced until book two (this recipe is based on book two's cover), but (questionable) food is a common experience throughout the series. "I'm still getting used to the cafeteria, because it serves the WEIRDEST food. Roasted tentacles?! Yuck. I finally tried more of the food. It's really not that bad if you're hungry enough." "Grunt! *Don't worry about messing up a recipe, the food will still be edible. You won't starve, it'll just taste horrible." 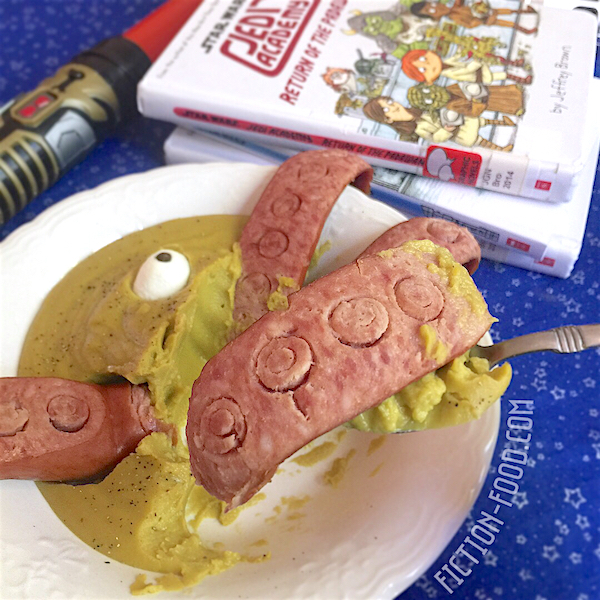 Haha, the food might be described as "yuck" in the books, but this version is very tasty even though it looks disconcerting. ;) It's really "Grunt +"! In a large pot over medium heat, sauté the garlic & onion in 2 tsp. of oil until soft, about 5 minutes. Add the chopped carrot & celery, bay leaf, & broth. Bring to a boil & then add in the split peas. Lower to a simmer & cover. Cook for about 50 minutes. About 15-20 minutes before the pea soup is finished cooking, work on the sausage "tentacles" in the next steps. 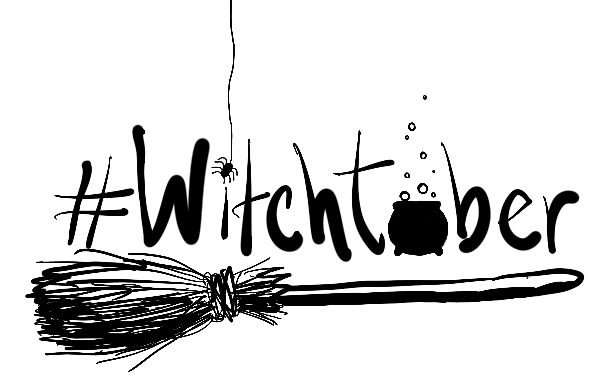 Bring a couple of inches (deep) of water to a boil in a large pot (enough to cover the sausage). Cut the sausage into 3-4 segments, & then cut those segments in half diagonally so that they are thicker on one one end & tapered on the other. Using a straw or small circle cutter, press deep circles into the cut sides of the sausage pieces (for each piece designate a top & bottom of the "tentacles"; the circles go on the underside), making sure not to go all the way through. Place the sausage pieces into the boiling water & bring the water back to a boil if needed. Lower to a simmer & cook for about 8-10 minutes. The tapered edges of the "tentacles" should become curled. Remove the sausage from the pot & place on a large paper towel & pat away any excess water. Pat several small mozzarella balls with a paper towel to remove excess liquid. Using a knife, puncture a shallow hole into each ball & then press a whole peppercorn in so it looks like a the pupil of an eye. Remove the pea soup from heat & stir. Pour half of the mixture into a blender & hold a towel over top instead of the blender lid so steam can escape. Puree the soup with ~1 1/2 tsp. olive oil for a few minutes until smooth & creamy. * Add in salt & pepper to taste. Repeat this step for the remainder of the soup. 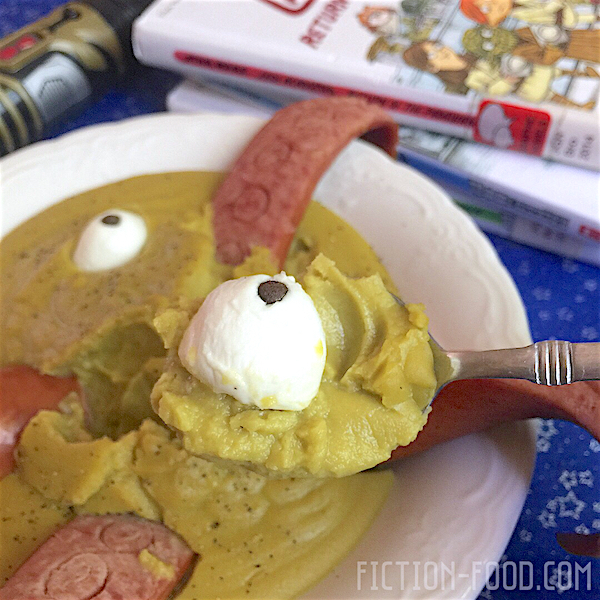 Scoop the soup into individual serving dishes & lay on the sausage "tentacles". Place on a few mozzarella "eyeballs" & you're all done! It looks disturbing (& hilarious!) but it's delicious! Serve with rustic bread (optional). * This soup will be quite thick & will get thicker as time passes (almost like mashed potatoes). If you'd like it thinner, add warm vegetable broth when blending, starting with a small amount like 1/3-1/2 cup, until you reach your desired consistency. Suggestion: If you'd like your GRORG chunkier, boil some chopped carrots & potatoes in a seperate pot until tender, drain & then fold them into the pea mixture after blending & before spooning into individual bowls. 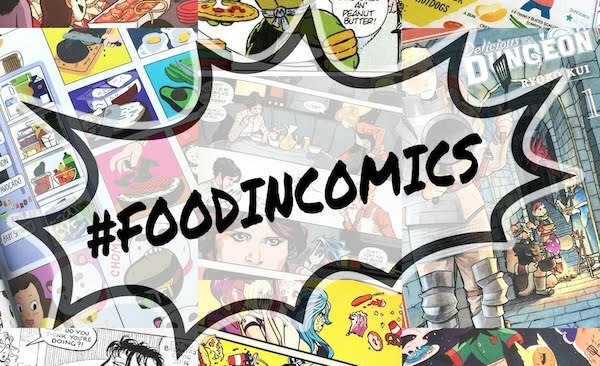 For more food from comics, visit the #FoodinComics link-up!